A While on the Nile video slot helps you explore the Nile with Superbet and Wild Multipliers. Indeed, in this game, you’ll travel back in time when the mighty Egyptians held all the riches in the world, thanks to their Emerald mines. What’s more is that all their wealth is at your fingertips if you managed to decipher the hieroglyphs and align identical symbols on a payline. All and all, A While on the Nile is a beautiful video slot. Additionally, it’s a great alternative to the popular Cleopatra slot from IGT, since this game has more paylines. Plus, this game has a good humoristic touch that will for sure entertain you regardless of the device you play on. Intrigued by this game and all the features it has. Then don’t miss the short review below before you head over to any casinos listed on this page. How to trigger the bonus features of A While on the Nile video slot? In short, in this game they’re three symbols you need to keep an eye on. The first one is the blue Scarab. Indeed, landing 3 Scarab symbols on reel 1, 3 and 5 triggers a Pick n’ Click game. In essence, when the bonus is activated, you’ll see the reels transform into 20 Scarab symbols. To start the bonus feature, simply click on one of the Scarabs and it’ll reveal an instant coin win. Also, know that the game will end when you show a “collect” symbol. The second important symbol of the game is the Green Emerald and landing 3 in view will give you 3 Free rounds. The third important symbol of this game is the Pharaoh! Indeed, know that he is both a Wild and a Multiplier (up to 10x). Depending if you’re playing with or without the SuperBet Feature. Why should you play A While on the Nile video slot? By and large, the main reason why so many players choose to play A While on the Nile slot is the possibility to get 10x Multipliers. Moreover, high rollers especially like the fact that the RTP increases with the players’ wager. 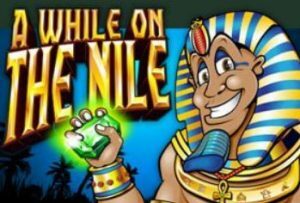 A While on the Nile is a volatile slot, so in the long run, you’d be better off playing this slot if you’ve got a proper bankroll behind you or if you’ve claimed a casino bonus. Get a taste of Egypt at any NJ casinos listed on this page and have fun!